Before starting a new medication, it's important to know what it is and how it works. Here's a closer look at SIMPONI®. SIMPONI® is an anti-TNF biologic medicine. It targets and blocks a protein called TNF-alpha (tumor necrosis factor-alpha). People with certain autoimmune diseases have too much TNF-alpha. 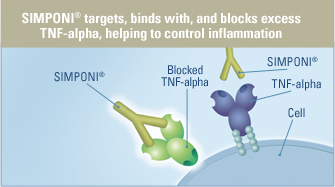 SIMPONI® targets and binds with extra TNF-alpha. This helps to block an underlying cause of the symptoms. It can bind with 2 forms of TNF-alpha, and it can bind at more than 1 location. Blocking too much TNF-alpha can make it harder for your body to fight infections. See your doctor regularly. Tell him or her if you have side effects.